LIP, University of Minho, IDPASC and the COST action g2net are organizing a school on Data Science in (Astro)Particle Physics and Cosmology, targeted at PhD and MSc students, as well as at researchers from different areas, interested in learning about the use of modern data analysis tools. 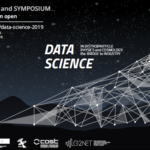 The school will be held in Braga, Portugal, from 25 to 27 March 2019, and will be followed by the symposium Data Science: Bridging Fundamental Research and Industry(28-29 March 2019), which aims to make the bridge between the academic and industry worlds. The school will have theory and practical lectures, with a strong hands-on component. The students will be invited for a data challenge where gravitational waves data will be used for a classification problem. The COST action CA17137 – g2net: a network for Gravitational Waves, Geophysics and Machine Learning – will financially support the participation of some students and young postdocs in this school.